Review posted February 17, 2018. Simon & Schuster Audio, 2017. 2 hours on 2 discs. I already wrote about how amazing this book was in my review of the print version. I found new levels of amazing by listening to it. Jason Reynolds reads his own poetry, so he knows exactly how each line was intended. I noticed details I didn’t notice when I read it myself. 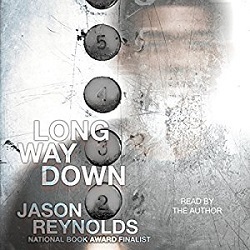 This audiobook is about a kid in a situation where what he thinks he needs to do is kill the person he’s sure murdered his brother. And then on each stop of the elevator someone gets on who was a victim of the same rules Will is trying to live by. There’s whole new power in listening to Jason Reynolds read the words himself. It’s a short book in either form, but it’s not one you’ll easily forget.